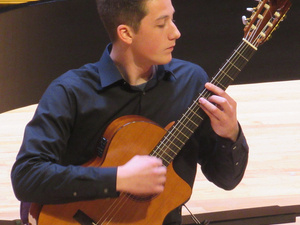 Frostburg State University student Paul Zimmerman will present his junior guitar recital on Thursday, April 18, at 7:30 p.m. in the Pealer Recital Hall of FSU’s Woodward D. Pealer Performing Arts Center. He will be accompanied by guest artist Greg Hays on guitar. This event is free and open to the public. Zimmerman’s program will include “Vals, Op. 8, No. 3” by Agustin Barrios; “Etude No. 11,” “Prelude No. 1” and “Etude No. 7” by Heitor Villa-Lobos; “BWV. 998” by Johann Sebastian Bach; and “Sonatina” by Federico Moreno Torroba. “Vals, Op. 8, No. 3” was composed by Paraguayan virtuoso classical guitarist Barrios. He lived from 1885 to 1944 and is regarded as one of the greatest performers and composers for guitar of his time. Barrios’ first introduction and inspiration for music was folk music of Paraguay, including Paraguayan polka and vals, commonly known as Peruvian waltz. “Etude No. 11,” “Prelude No. 1” and “Etude No. 7” were all composed in the early 1900s by Brazilian musician and conductor Villa-Lobos. His music was influenced by Brazilian folk music and by stylistic elements from the European classical tradition. His Etudes were dedicated to Andrés Segovia, classical guitarist from Spain, and his Preludes were dedicated to his spouse, Arminda Neves d’Almeida. “BWV. 998” is a piece by Bach, the German composer of the Baroque period. “BWV” or “Bach Werke Verzeichnis” was a catalog of Bach’s works first published in 1950 by German music librarian and musicologist, Wolfgang Schmieder. The composition included two movements: “Prelude” and “Allegro,” the latter being a binary form dance with 16th notes. Torroba’s “Sonatina” is a three-movement piece composed in the early 1900s and follows the traditional fast-slow-fast arrangement. Torroba was a Spanish composer, conductor and theatrical organizer. He is known as one of the leading 20th-century composers for guitar. His music often shows influence from Spanish folk music. Zimmerman studies under Patrick Sise at FSU. He previously studied under Jody Mosser. Zimmerman has been on the Dean’s List and anticipates graduating in spring 2020 with a bachelor’s degree in music – guitar performance. A graduate of Northern Garrett High School in Accident, Md., he is the son of Kathy and Richard Zimmerman of Grantsville. His career goal is to become a teacher. A reception will follow the recital.